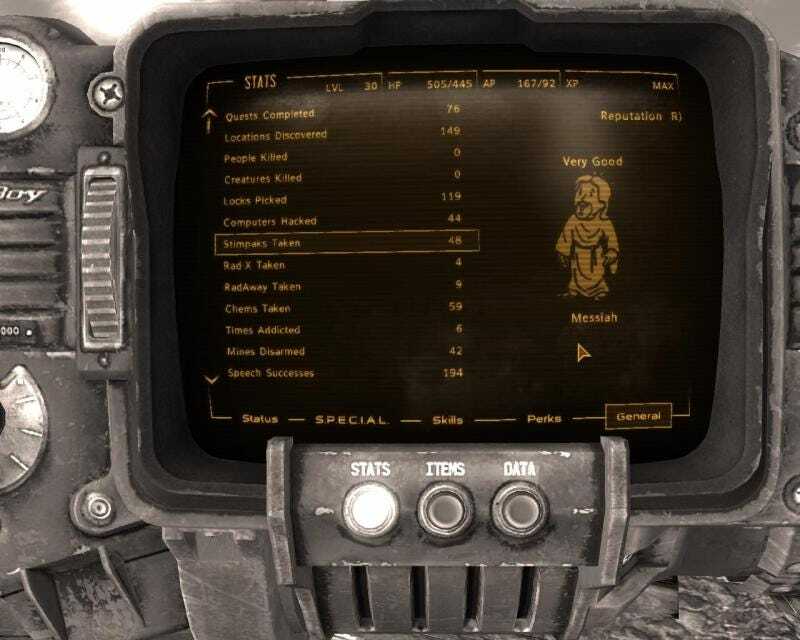 NeoGAF user water_wendi started a couple of playthroughs in Fallout: New Vegas before deciding to try a complete pacifist run. Fifty-one hours later, he finished the game, with no humans nor animals harmed in the making of his story. He thinks it's possible to go 70 hours in this game without killing anyone, too, calculating about 2 to 3 hours on a sidequest where kills aren't necessary, and another 10 if you explore and loot everything. All told, he's logged about 100 hours in the game, and is putting it away for now. It's impressive, but left unsaid is how many times, if any, he found a gun in a locker and just said the hell with it, blew someone's head off, and reloaded his previous gamesave. Or maybe he really was as pure as his messiah rating proclaims.